The Church honors the Holy and Great Martyr Irene on May 5th. She lived in the fourth century in the city of Magedon, Persia. Her royal parents named her Penelope, and her father Licinius decided to protect her from the evil world. When she was six, he installed her in a small castle with every comfort and a staff of servants. The wise tutor Apellianus instructed her, from behind a curtain. Licinius placed statues of pagan gods as guardians throughout the castle. Here she was to live till her parents betrothed her to a worthy young man. Penelope begged her father not to shut her away from the sound of bird songs and the sight of the changing light of day. But the king was determined, so she stayed where she was. What Licinius apparently did not know was that the old tutor Apellianus was a Christian, and was instilling the teachings of Jesus Christ in his young daughter. One day Penelope had a disturbing vision. She saw a window suddenly open in the castle wall. A dove flew in with an olive branch in its beak, and dropped it on a table. Then an eagle swooped in with a wreath of flowers, which it also placed on the table. Finally a raven flew in carrying a wriggling snake, and dropped it on the table. Penelope turned to her tutor to explain these things. Apellianus, in awed wonder, told her the that they were signs of her becoming perfect in faith and serving God well, but also enduring sufferings sent by Satan. Apellianus said it was clear that she was meant to belong to Jesus Christ. Realizing this was also what she wanted, Penelope was baptized, taking the name Irene. When Irene refused every suitor her father offered her, he couldn't understand such disobedience in his carefully-raised daughter. And why, he thundered, had she dared to change her name? But when he tried to punish her by having horses trample her, the animals charged him instead and killed him. Irene prayed fervently, and raised her father from the dead. 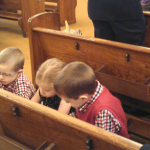 Seeing the miracle, he and his wife, plus many onlookers, became followers of Christ. After that, Irene served the Lord by converting and healing great numbers of people. But she would also have more encounters with pagan rulers. One of these, the Persian king Sapor, called her a "destroyer of royalty" because she had turned her father from the Persian gods and had defeated or converted other royal pagans, after enduring humiliating tortures. God revealed to Irene the time when her life was about to end. She found a new tomb and asked followers to close it with a large stone after she had gone inside. When they came again several days later, they found it empty. On this day we read Acts 10: 21-33, in which the apostle Peter "shakes up" the community by unlawfully meeting with a non-Jew, Cornelius. The great martyr Saint Irene also shook things up and was accused of "destroying royalty." Their "unlawful" actions were for the same reason: they were servants of the King. Our parish is blessed to host the annual Diocesan Conference on June 24 and June 25, 2017. Thank you for your tremendous outpouring of prayers, and support for those affected by Hurricane Harvey and its aftermath. 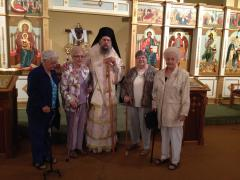 IOCC's Frontliner team have visited Orthodox parishes for Sunday Divine Liturgies and other services, offering emotional and spiritual support to local clergy and affected parishioners. Orthodox clergy represented the Orthodox community and IOCC at the interfaith service held at the Convention Center on Sunday 9/3. IOCC’s first muck out took place on Saturday 9/4 with 13 volunteers and continued on 9/5 with an additional 15 volunteers. Rotating teams have completed 15 assessments and nine muck outs to date. More houses are slated for assessments in the coming weeks. IOCC arranged, through partners Church World Service (CWS) and Good360, for two truckloads of hygiene kits, clean-up buckets, food, and baby products to the Houston area. The CWS truck arrived on 9/4 at St. Basil the Great Greek Orthodox Church containing 200 clean-up buckets and 6,000 hygiene kits. Distribution began immediately, and all the clean-up buckets were distributed within 24 hours, highlighting the great demand for these supplies. IOCC staff is checking in with every Orthodox parish in the region to assess clean-up and other needs. 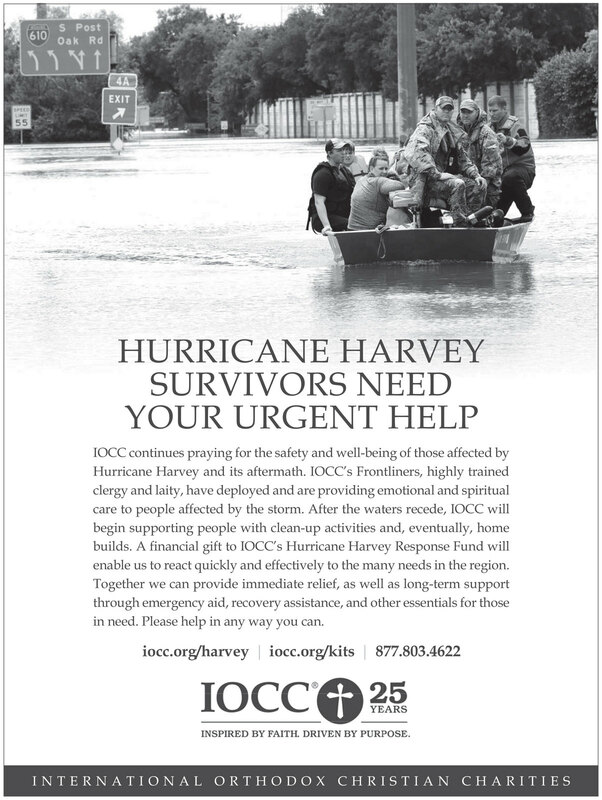 Parishioners who have specific clean-up needs are asked to speak to their parish priest, who will coordinate with IOCC. 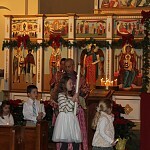 Download a bulletin insert to be used by your parish. Click here for a full size bulletin insert or half page bulletin insert. Create clean up buckets, Our supply of clean up buckets has been depleted at our warehouse, please consider creating clean up buckets and shipping to our warehouse for distribution. Instructions on creating and shipping kits here: iocc.org/kits. With expectations of a busy hurricane season, we are aiming to be able to respond as quickly and effectively to areas of need as they arise.